Prime Minister Netanyahu will demand that President Barack Obama commit to a strike on Iran if sanctions fail, say sources. 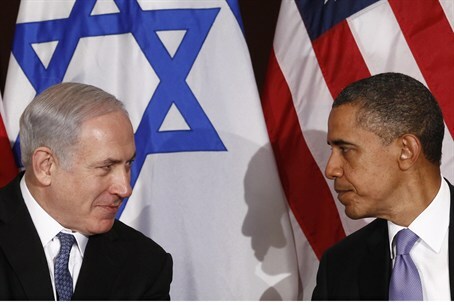 Israeli officials, the Guardian reported, say that Netanyahu is not happy with Obama's “vague assertion” that all options are on the table in dealing with Iran. Netanyahu wants Obama to state unequivocally that Washington is prepared to use force if Iran's nuclear program advances beyond specified red lines, they said. Sources in the U.S. administration say, however, that Obama is unlikely to make a major shift in policy in public although he may give Netanyahu firmer assurances in private. Despite Obama’s position, U.S. military officials said Wednesday that America is preparing a plan to strike Iranian nuclear targets in the event that sanctions fail to persuade Tehran to halt its hurtle towards atomic development. A report by the Bloomberg news agency quoted U.S. Air Force Chief of Staff General Norton Schwartz as saying such a strike would be carried out if Iran fails to prove its nuclear develop program is geared solely towards peaceful purposes. The report indicated that options under consideration included the possibility of aerial refueling for Israeli planes as part of the assault. Targets under consideration included the regime in Tehran, the Iranian Revolutionary Guard Corps, the Ministry of Intelligence and Security, the Quds Force, and various Iranian military bases. Meanwhile, a poll released Thursday said that 81 percent of Israelis oppose a solo Israeli attack against Iran. The poll, taken by the Dahaf organization in Israel on behalf of the Brookings Institution, found that if, on the other hand, Washington approved an Israeli action against Iran, some two thirds of Israelis would support it. 34% would oppose a strike regardless of Washington's approval.